Suhas Mallya's Corner: Back to School! 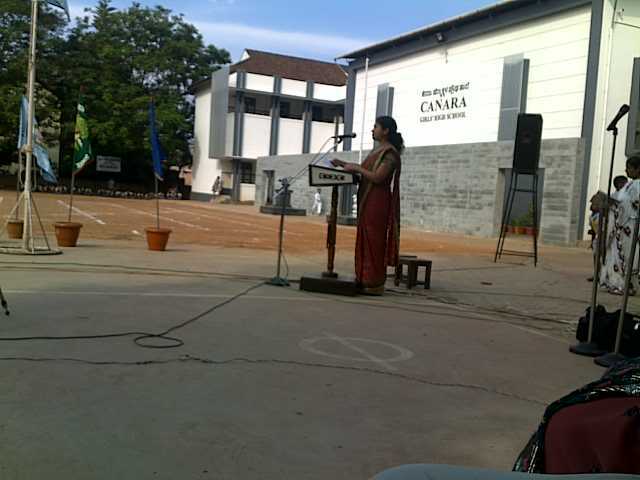 Earlier this week, I had the privilege of accompanying my wife to her alma mater where she was invited as the Chief Guest for her school's Annual Day celebrations. 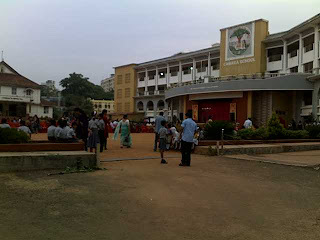 The Canara Institutions (of which my wife's school is a part), much like Loyola High School in Margao where I studied, is over a century old. They have both defined the lives of multiple generations - often within the same family - and are what I consider, "institutions with a soul". I cannot describe what I mean by that, but those of you who have studied in either - or similar - institutions will know what I mean. It was at this Annual Day that I suddenly realized that in March of this (academic) year, I complete 20 years since I walked out of "high school" - and with it, walked into a new world, leaving the many pure and simple pleasures of school life behind. It's been 20 years since I attended programs like the Annual Day, Sports Day and so on. Some of these memories have been coming back through my cousins and of course, my own son as I see and hear them prepare for some of these functions and events. But it is quite something else to be physically present there and transport yourself through a decade or two - or three - and a million memories. All in a matter of minutes, without Picasa, without Facebook, without external hard disks, without an electronic screen. But it isn't the memories I am writing about. There was something else that caught my attention - and rekindled my joy and my optimism. Be it the march-past, martial arts display, nursery kids' program, prize distribution or the MCs, the spark in their eyes was so uniformly present. In fact it got to a point where I engaged in a furtive exercise to find a kid who was merely going through the motions without that spark - I am glad to say it was an exercise in futility. The confidence with which even the nursery kids were strutting their stuff, was amazing. The few kids I got a chance to talk to - albeit briefly - caught my attention because of the confident tone in which they were speaking to a total stranger. Even at the risk of muting the efforts of their teachers and parents, I had to hand it to the kids. In the backdrop of all the nonsense that has been demoralising me in the last few months, the spirit I saw in these kids was a morale booster. It was a reaffirmation of how traditional institutions can adapt to the times to measure up and prepare the next generation. Being a reputed but traditional institution in a semi-urban but fairly conservative setting, I had expected good quality and high standards. But I had also expected an air of resigned contentment even if without any complacency. The spark and enthusiasm I saw in the children - and the measures taken by the school to gear itself up for modernization - took me completely by surprise. Fortunately, a very pleasant - and encouraging - one. Like someone rightly said, "We worry about what a child will become tomorrow; yet we forget that (s)he is already someone today"! After having briefly "gone back to school", the journey coming back home turned out to be a journey back to reality, when the attender on the Rajdhani Express came around asking for tips! Looks like we have a lot of people we need to send (back) to school!